Children in Y2 are expected to write independently using a variety of different features included. 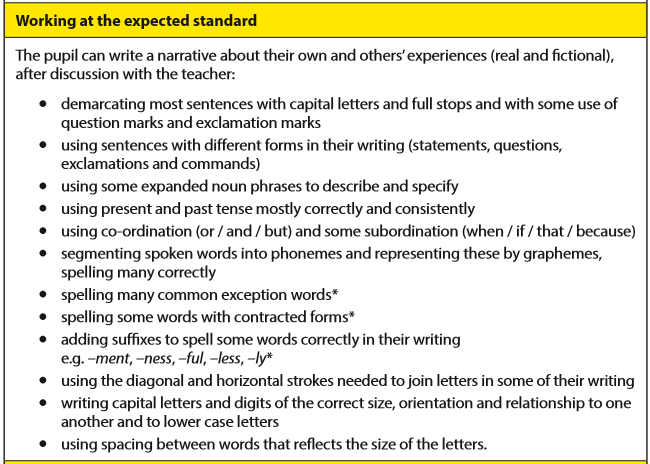 The table below details what teachers look for in children's writing. Children sometimes find it difficult to know what to write about. Parents and carers can help by talking to their children about the topics they are learning about in school to help them remember information which they can then write about. Spelling is a large part of writing assessment in Y2. Learning the weekly spelling list sent home each week is vital. We do spend time in school learning spellings but a lot of children benefit from further practice at home. We are trialling a spelling programme called sumdog spelling at the moment which the children can access at home through the link below.